(Inside Science) -- Spring has now officially arrived in the Northern Hemisphere. Already, many deciduous trees are shaking off their winter stupor and getting ready to unfurl delicate new leaflets. "In the coming weeks, we're definitely going to start to have bright greens, all the way to a sage green," said Carrie Andresen, a park ranger at Catoctin Mountain Park in northern Maryland. The park's forests contain oak, maple, hickory, tulip poplar and other trees. 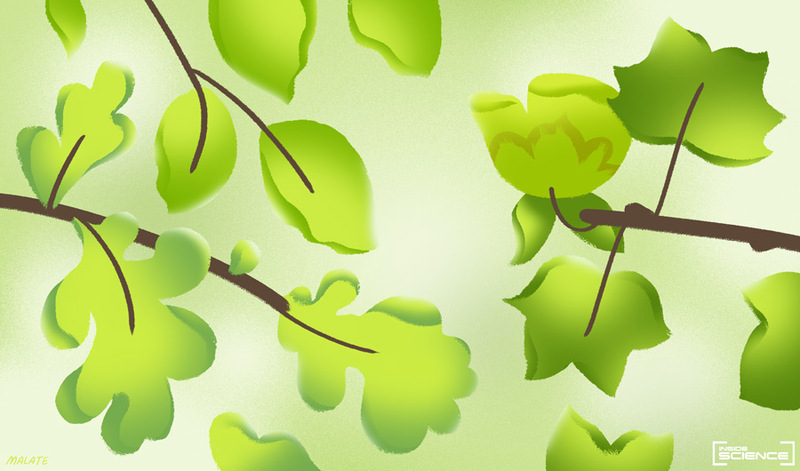 In general, the green of spring leaves is fresher and lighter than the deep verdant hues of summer's mature canopy. The reasons, say scientists, have to do with the way foliage develops. Young leaflets' chloroplasts -- the part of the plant that contains the green pigment chlorophyll -- are still developing, so the leaves tend to be lighter. New leaves are also thinner, with fewer waxy or tough layers that can darken the green color. When leaves start maturing they begin making additional pigments. Some of these molecules can give leaves the yellow and red colors you see in the fall. Younger leaves generally have fewer accessory pigments, so the green of the chlorophyll that is present is not masked, said Gregory Moore, a plant scientist at the University of Melbourne in Australia. This is another reason why spring green can look brighter, he said. However, some new leaves, like those of the red maple, are typically tinged red in the spring. This is because lots of sugar is pumped into the small, young leaves to fuel their growth, and the sugar is sometimes converted into the red pigment anthocyanin and stored in the leaf, giving it a reddish appearance, Moore explained. As the leaves mature, the extra anthocyanin is metabolized and the leaves turn green. The reddish hue can have an extra benefit to the young plant: protection from sun damage, said Susan Ustin, an ecologist from the University of California, Davis. Ustin has studied the way foliage appears to cameras mounted on airplanes, drones, or even satellites in space. In addition to visible light, these cameras can often "see" light in the infrared part of the spectrum, beyond what human eyes can detect. Plant leaves strongly reflect near-infrared light, so this extra information helps scientists estimate the type and density of vegetation in pictures sometimes taken from hundreds of miles away. Ustin said a remote camera monitoring an agriculture field, where the plants are typically all one species, might be able to detect the subtle pigment changes that happen from spring to summer. At an even larger scale, NASA satellites have captured the spring "green up" across giant swaths of Earth, showing, for example in these 2006 images of the Chesapeake Bay area (shown on the right), how an area with only a dusting of light green in April transforms into a lush landscape painted with deep green strokes in July. The color change shown in the pictures is likely primarily due to the increase in the number and size of tree leaves as the spring progresses, as well as the development of crops in the agricultural fields between forest patches, said Jeff Masek, a scientist at NASA Goddard Space Flight Center in Greenbelt, Maryland who specializes in satellite imaging of vegetation. Future satellites may carry cameras capable of capturing a more precise picture of leaf chemistry, Masek said. While a normal color camera like the one on your phone gathers only 3 channels of light (red, green and blue), so-called hyperspectral imaging cameras can capture hundreds of different channels across the electromagnetic spectrum. Hyperspectral cameras have been deployed on airplanes and sent to the International Space Station, and NASA is working on plans for a satellite with hyperspectral imaging capabilities that could launch in the next decade. The cameras can gather a wealth of data about the health and diversity of plants, said Phil Townsend, a biologist at the University of Wisconsin-Madison who uses remote imaging to study the functioning of ecosystems. A satellite with hyperspectral imaging could measure the pigments and structure of plant leaves, monitor nitrogen compounds in plants, or detect the presence of molecules, such as compounds that some plants use to defend against insects, which are invisible to human eyes. All this information can help answer questions about plant biology on a large scale -- such as how healthy whole forests or fields are, or how well plants are exchanging nutrients, water, and gases like carbon dioxide and oxygen with the surrounding environment and the atmosphere. Back at a more personal scale, visitors to Catoctin Mountain Park are getting up-close views of spring vegetation, Andresen said. "It's that sense of escape, like animals coming out of hibernation. We as humans are escaping the cabin fever, we're wanting to get out on the trails and really discover the changes." She said that in addition to the delicate colors of emerging leaves, spring is marked by its diversity of hues, from the vibrant green of moss, to the red flowers on the redbud trees. The park offers visitors the chance to borrow special glasses designed to enhance the distinction between red and green colors for some people with colorblindness. "Spring and fall seem to be the most popular times for people to check them out because of the difference in bright colors during those times of year," she said.